In some cultures, music is used to induce a shared ecstatic trance state. Individual participants are then driven to shout and move wildly, as their spirits rush out seeking expression. 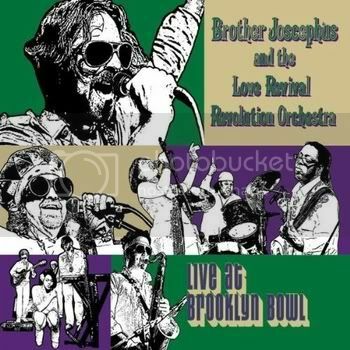 On Live at Brooklyn Bowl, Brother Joscephus and the Love Revival Revolution Orchestra give us an idea what this sounds like. The key word in the name of the band is revival, as in “revival meeting”. This is not sacred music, but the spirit is very much involved. When I reviewed Brother Joscephus‘ debut album, I spoke of the theatricality of the music and the clear New Orleans influences, and those qualities are very much still here. But, heard live, other qualities emerge that just weren’t as clear on a studio album. One is the generosity of Brother Joscephus himself; most of the other musicians who made up the band on the night this was performed get spotlights to show what they can do, which is a lot. Another pleasant surprise here were the little hints of jazz that turn up from time to time. The songs here are not, taken as a group, as thoughtful a batch as last time. That is as it should be, since a studio album is more geared towards listening, while a live performance like this is about presenting the best party possible. These songs are appeals for love in its varying forms, and the lyrics would sound a bit naïve if the performances were not invested with so much passion and fervor. Brother Joscephus himself is a soulful shouter. On Somebody to Love, (yes, that’s a cover of the old Queen song), he yields the microphone to Seoul Sistah #1, (AKA Samia Mounts), who delivers a stunning gospel soul performance that brings to mind Aretha Franklin in her prime. The band is huge. I counted twelve instrumentalists, four main singers, and a chorus of five background singers. There is a horn section of trumpets, trombone, and sax, but they can switch to clarinet and tuba for a wonderful take on When the Saints Go Marching In. Revolution of Love is a funky workout that turns jazzy when the horn players step out to take their solos. The trombone solo is particularly tasty here. Shine On has a funky groove, but the band all but drops out for a middle section that features first the piano, and then is joined by electric guitar playing pure rock. These are some of the ecstatic moments that I mentioned, and there are more. In each case, it is easy to see how the musicians got swept up in the group sound, and the band does a great job of finding the groove again and getting back to the song. So you could call this jam band music, but in the best sense. The band is tight enough to get loose. That sentence may not make much sense on the page, but you can hear it throughout this album. For the last two songs, I Still Love You and Mighty Mighty Chain of Love, the band takes the pace down, and gently brings the audience back to earth. I criticized the last album for flagging at the end, but, in the context of a live performance, I see how this works, and it is done beautifully here. An album should leave you wanting to hear more, and a live album should make you want to attend a performance. Live at Brooklyn Bowl succeeds perfectly on both counts.